Kenya Railways has taken delivery of a telescopic boom crane to recover failed or derailed vehicles on its standard gauge railway. 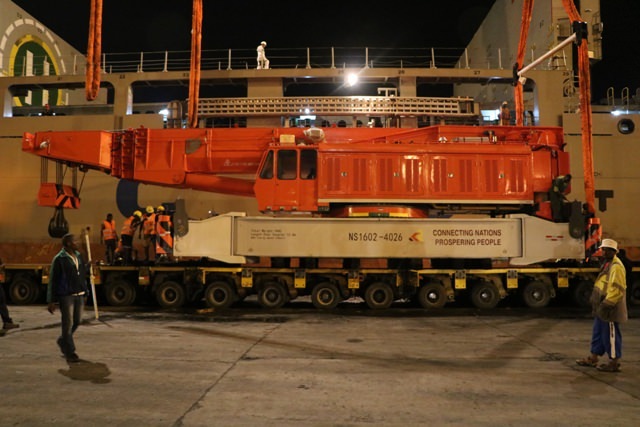 The crane has a maximum lifting capacity of 160 tonnes and an expected lifespan of 70 years and arrived aboard the Tian Zhen vessel at Mombassa Port on November 1. It can also be used to lift equipment or for loading at the depots or sidings and has the potential to be used during track maintenance to lift track panels and rail sleepers. The crane has a diesel-hydraulic engine, hydraulic braking system to prevent accidental movement during operations and uses outriggers to improve stability. The crane is also fitted with a telescopic boom which extends to different lengths depending on the required lift. In order to get to the required site, the crane is is hauled by a towing locomotive moving at speeds of up to 120km/h. Engineering, procurement and construction contractor China Road and Bridge Corporation (CRBC) was required to supply two supply two recovery cranes as part of its agreement with Kenyan authorities. The second crane is expected to arrive in December 2017.